I dearly love photography challenges and just discovered a “new” one (to me!) hosted by blogger Dutch Goes the Photo! Frank posts a new challenge every Tuesday. 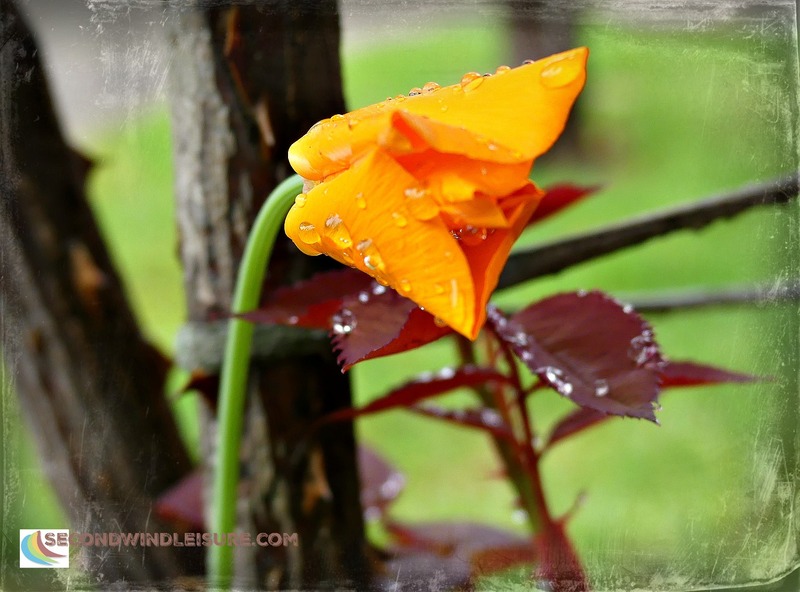 I just made it under the wire with my submission of California Poppies, wet and dry, for the “spring” theme! This freshly opened poppy enjoyed a spring shower as it struggled to open last week under the heavy raindrops. 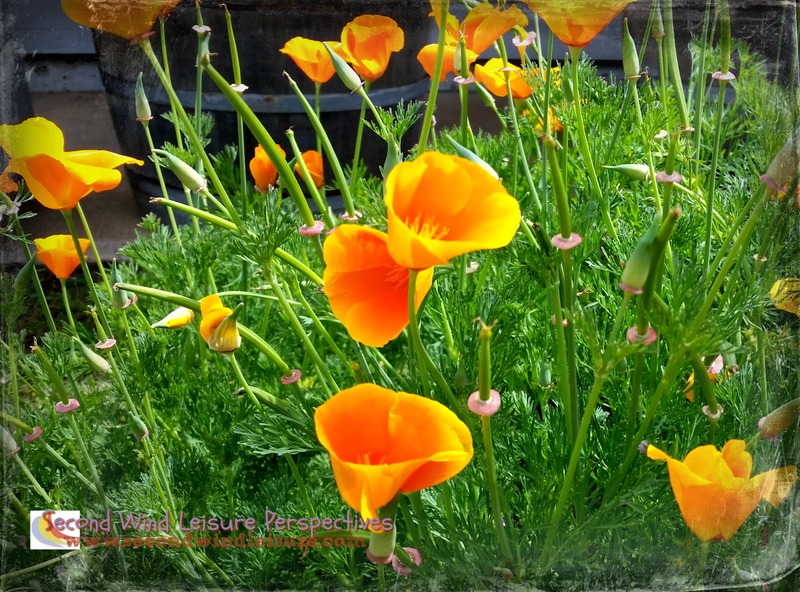 California Poppies are the state flower and flourish this time of year everywhere! One can find them on hills, the sides of the roads and freeways, providing pops of orange against the beautiful, fresh green landscapes we see here in Northern California. Top photo was taken with my Panasonic Lumix FZ300 camera in macro mode. Bottom photo taken with my Samsung Galaxy S5 phone. Both post-edited in PicMonkey (crop, contrast, frame). Enjoy a bit of early spring from Northern California! Sorry, I thought that the post would link back to my book, which partly describes how we planted 888,246 acrylic poppies in the Moat at the Tower of London. I reproduce my writing here as my own perspective. ‘The ‘Poppies’ event in 2014 was to mark one hundred years since the first full day that Britain was involved in the First World War. Poppies grow naturally in the wild following large-scale disturbance of soil, so grew abundantly following the mass shelling that took place in the battlefields of World War I, creating beauty from destruction. Thanks, Chris, I had read some blog posts about the significance of the poppies. I wasn’t aware of your book. Thanks for sharing this information. Sorry, I can only offer acrylic ones. Gorgeous! I’m drinking them in! Southern California is enjoying a bounty of wildflower bloom this year due to the long rainy season. We’re still hoping to get out and see them for ourselves. They have a brief but splendid season. Your photos are wonderful, Terri. Thanks for sharing. Thank you, Sharon, I heard about the super bloom. I’ve seen it a few years ago, but this year has been the best in decades. Enjoy and take lots of photos! What a wonderful state flower! They represent California perfectly! Warm, bright, beautiful, friendly! Thank you for displaying our state flower in all its glory! Ever been to the poppies preserve? It is beautiful. You should find a blog on them on my sitr. No, but I would die (of happiness) there like Dorothy almost did, LOL!